Sound travels through the ear canal and reaches the eardrum. Sound waves cause the ear drum to vibrate, setting the three tiny bones in the middle ear into motion. This causes the fluid inside the inner ear (cochlear) to move the hair cells. The cochlear hair cells change the movement into electric impulses which are then sent along the hearing nerve to the brain and interpreted as sound. A cochlear implant is an electronic hearing device designed to bypass the damaged parts of the inner ear by electrically stimulating the hearing nerve. The nerve then sends a signal to the brain where it is interpreted as sound. 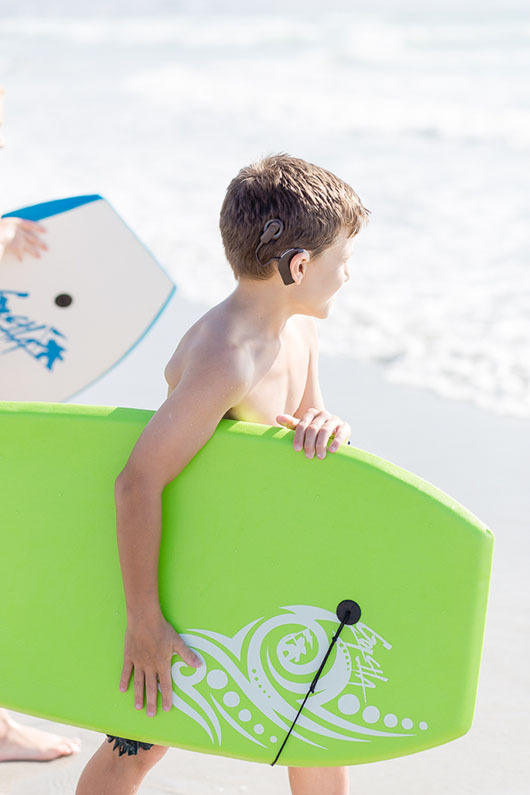 Cochlear implants provide an important option for children and adults who gain little or no benefit from hearing aids. 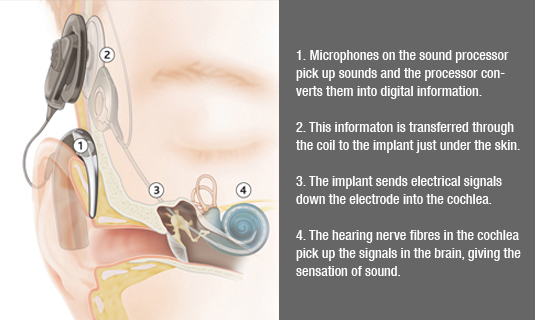 A cochlear implant has both internal and external parts. A receiver and internal magnet, placed under the skin behind the ear (2). Lead wire leading to electrode array (3). An electrode array (series of electrodes) placed in the cochlear (4). A sound processor powered by batteries (looks similar to a hearing aid) (1). A cable and circular coil connected to the sound processor that is held on the head by a magnet (2). The microphone of the sound processor picks up sound. The sound is processed into digital signals. The digital signals are sent to the transmitter coil. The transmitter coil sends the digital signals through the skin where it is converted into electrical signals by the internal device. Electrical signals are sent to the electrode array in the cochlea to stimulate the hearing nerve fibers in the inner ear. Adults and children who have lost their hearing as a result of meningitis should be referred and assessed for possible cochlear implantation as a matter of urgency. If deafness is congenital or prelingual, younger children seem to progress faster and benefit more than older children. If deafness is postlingual (over age 5), children of any age can benefit, if implanted shortly after onset of profound hearing loss. Prelingually deaf children older than the age of 3 years should have documented evidence of developing oral language. Children over the age of 4 years with no oral language will be considered only on a case by case basis. A child older than 5 years with no oral language is unlikely to benefit from cochlear implantation. Severe to profound bilateral sensorineural hearing loss. Limited benefit from hearing aids despite appropriate training and consistent hearing aid use. Children with auditory neuropathy spectrum disorder who have been fitted with appropriate hearing aids and are still making slow progress in speech and language development. The gap between spoken language age and chronological age will need to be be assessed (as this has an impact on the expectations for speech-language success with the implant). The child must have access to a school and therapy program with a strong auditory emphasis. Children with additional needs will be considered for assessment on a case by case basis. The family must be willing and able to take part in extensive pre- and post- implant assessment and therapy. Family must have realistic expectations of benefit. Child must understand process and provide consent (if possible and appropriate). Deafness cannot be due to lesions of the acoustic nerve or central auditory pathways. Deafness cannot be due to an absence of cochlea development. Cochlear ossification that prevents electrode insertion may affect your child’s candidacy. These factors can only be determined by the radiological evaluation (CT and MRI scans). Bilateral moderate to profound sensori-neural hearing loss (I.e. >85dBHL at 2000Hz and above for the better ear (including ski-slope or reverse losses). Use mainly spoken language for communication. No maximum age as long as the person is medically fit enough to undergo surgery. Limited or no benefit from hearing aids. Adults with additional needs are not excluded and considered on a case by case basis. No radiological or surgical contra-indication. Duration of deafness and previous use of hearing aids are important factors which contribute to a more successful outcome. Speech and language assessment (children). Consultation with an Ear-Nose-Throat Specialist. Possible other investigations that may be necessary. Once the assessment has been concluded a decision on whether or not to proceed with the implant will be made between the patient and the TH-US-CIU clinical team. The surgery is performed under general anaesthesia. The surgeon makes a small incision behind the ear and inserts the internal device. The audiologist performs detailed testing at the time of surgery to test the function of the implant and response of the hearing nerve to electrical stimulation. This helps to ensure the best hearing outcome is achieved from the implant. Most patients are able to go home on the day or the day after the surgery. Initial fitting of the external device and activation/switch on of the cochlear implant occurs approximately four weeks after surgery by the Audiologist. In the first 4-8 weeks very regular (at least weekly) cochlear implant programming (mapping) occurs. This is tailored to the patient’s hearing and lifestyle needs. Listening and communication practice using the implant will allow faster adjustment to the new sound. TH-US-CIU provides support for family and other professionals involved to allow most benefit from the new listening experience. Programming (mapping) of the device at regular intervals. This is a lifelong process. Ongoing assessments in order to monitor progress. Troubleshooting any problems you have with your device. Supply of loan equipment where required. Communicating with medical aids on behalf of candidates. Keeping you abreast of the newest technology available. TH-US-CIU regularly reviews the technology and the selection criteria used internationally, to ensure that the latest developments are available for candidates and cochlear implant users.